XL1845 is a carefully homogenized blend of synthetic bases combined with P.T.F.E. and molybdenum, as well as E.P. (extreme pressure) additives. XL1845 is a superior waterproof non-melting grease, which measures 90lbs plus on the Timken Load test. 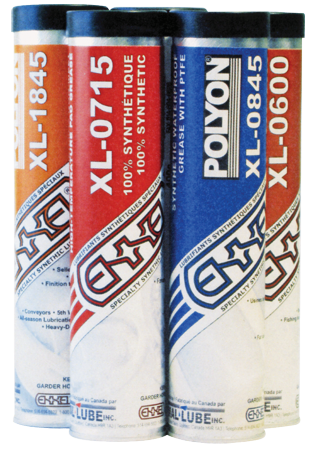 The additives used in the blending of XL1845 have been designed to give the greatest adherence to metallic surfaces. XL1845 virtually eliminates direct surface-to-surface contact of metal parts when machines are idle, during initial start-up, and during intermittent use. XL1845 is resistant to acids, alkali and salt water. This grease is recommended for severe environmental conditions as well as heavy loads. XL1845 is available in several NLGI Grades, and can be formulated with a range of base oil viscosities.